1. A set of alloy wheels will improve the appearance of your vehicle and in so doing will make your vehicle stand out from the crowd. 2. 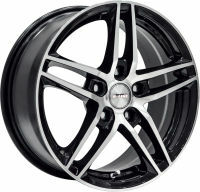 Alloy wheels will reduce the unsprung weight of a vehicle fitted with standard steel wheels. The benefit of reduced unsprung weight is more precise steering as well as a nominal reduction in fuel consumption. 3. Alloy is an excellent conductor of heat, improving heat dissipation from the brakes, reducing the risk of brake failure under demanding driving conditions. 4. When selling alloy wheels applying the "inch up principle", there is an improvement in the steering response and road holding, especially when cornering. 1. Firstly, the wheel must appeal to the customer. This is the diameter of an imaginary circle drawn through the centre of the bolt holes. The P.C.D. of the wheel should match that of the vehicle exactly. P.C.D. is measured in mm. E.g. 100/4 means the wheel has 4 bolt holes and the diameter of the imaginary circle through the bolt holes is 100mm. A P.C.D. gauge is used to measure the P.C.D. of a wheel accurately. If one was to draw a line down the centre of the width of a wheel, the offset would be the distance between the back face (mounting face) of the wheel and the centre line. It is vital not to deviate to far from the offset of the wheel originally fitted to the vehicle. A wheel of radically different offset can cause serious clearance and handling problems along with accelerated tyre and bearing wear. The offset of the wheel can normally be found either at the back of the wheel or in the front of the wheel. "ET" precedes the offset and is therefor also referred to as the ET number e.g. ET35. A positive offset wheel would mean the back face of the wheel is in front of the centre line of the wheel. The more positively a wheel is offset the more it will sit inside of the wheel well. A negative offset wheel will mean that the back face of the wheel is behind the centre line of the wheel. The more negatively offset a wheel is the more it will fill the fender. This is the diameter of the centre hole of the wheel. It is crucial that the wheel spigot locates properly on the hub of the vehicle. Most rims work on a spigot ring locating system. This means the wheel has a large centre bore and the spigot ring, with the correct inner diameter for the vehicle's hub assembly, is inserted for the wheel to fit tightly onto the vehicle. There are wheels that are hub centric i.e. the wheel is manufactured with a centre bore to fit precisely onto a specific vehicle. If the wheel does not locate onto the vehicle's hub assembly correctly it will cause a vibration on the steering wheel and can lead to bad wear on the tyres and bearings. The width is the section between the tyre mounting flanges on the wheel. The diameter is the height of the wheel. All wheels should be carefully checked on the vehicle for fitting and clearance prior to use. Load capacity is the amount of weight a wheel will carry. This number will vary depending on the number of lugs, the PCD, the material used and the type of axle the wheel is used on. A wheel used on a free rolling trailer axle will carry more weight than that same wheel used on the drive or steering axle of a vehicle. All wheels will have the load capacity stamped on the back of the wheel. Plus-Sizing and Up-Stepping means what? Plus-Sizing or Up-Stepping are two terms given to the practice of raising the diameter of your wheels whilst at the same time reducing the profile of your tires to keep the overall rolling radius the same. Plus-Sizing will develop the handling of your car! 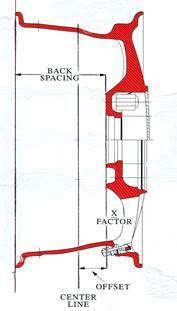 Each step will decrease the proportion of flexible tire sidewall to rigid alloy. This will improve response, will help keep the tire tread square to the road and will improve your car's feedback. If done correctly speed and odometer accuracy will retain and the car looks better. 1. Before fitting tyres to the rim always check the wheel on the vehicle first. Make sure the P.C.D. lines up, that the wheel spigot locates on the hub and that there is fender, strut and caliper clearance. 2. Once you have mounted the wheel and tyre, before lowering the vehicle, spin the wheel and tyre to ensure that it is not touching on the body, suspension or caliper. This will also make sure that if you have fitted bolts that they are not too long. 3. The wheel bolts or nuts must be tightened to the manufacturer's specified torque. The bolts and nuts need to be retorqued 100km after being fitted. 5. If the customer has kept his original spare make sure you have put the correct number of the original bolts or nuts with it. 6. Ensure the customer has a wheel spanner that will fit both the original nuts and bolts as well as the original nuts or bolts of the spare wheel. 1. If the vehicle has studs coming out of the hub, you will use a nut to fasten the wheel to the vehicle. Vehicles without studs will use a bolt to fasten the wheel to the hub of the vehicle. 2. Bolts and nuts have various diameters, threads and seating. 4. The thread pitch is the number derived at when dividing the number of threads in 10mm into 10 e.g. 8 threads along 10mm has a pitch of 1.25. 5. It is extremely important that the nut or bolt seat properly in the wheel bolt hole. Most wheels use a tapered nut or bolt (usually with a 60 taper). Some wheels, especially Mercede's wheels use a radius taper bolt. Never use an impact gun to install any alloy wheels. Why? There are two reasons for this. 1. There is an increased chance of marring a wheel with the use of a fast moving and possibly misaligned air tool. 2. The value and consistency of any threaded fastener clamping load can be achieved only by hand-installation using a quality, calibrated torque wrench. Ignore what you see during tire changes at a racing event. Pneumatic guns are used in those situations as a necessity in order to save time only. Don't make belive that you're in the pits at an endurance race when installing a customer's set of pricey custom wheels. Take the time to do it right. Yes, it takes more time to hand tighten as opposed to zipping the fasteners on with a gun, but it's worth i tin terms of customer satisfaction. Pay attention to torque value accuracy. When you do use a torque wrench, make the final pulls in a slow and careful manner, creeping up onto the final valve for "click". By abruptly "slamming" the torque wrench, especially when using a ratcheting "click" type wrench, you easily can tighten beyond the target value. Is this being nitpicky? Yes, but what's wrong with that? By avoiding the use of an air wrench and following correct tightening procedures, you will avoid damage to the wheel and greatly minimize the chance of a comeback "vibration" complaint. 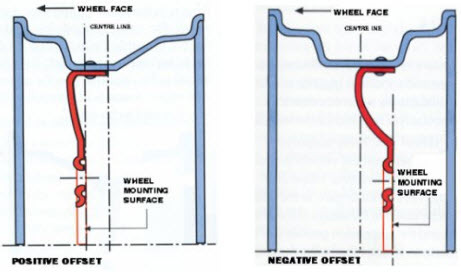 Over-tightening or uneven tightening easily can cause hub/rotor distortion, which will result in brake rotor distortion. After the initial installation, it's advisable to check and re-torque all wheel fasteners after the vehicle has been driven about 25 to 50 miles. If the technician does not have the opportunity to perform this initial drive, make a point of instructing the customer to bring the vehicle back to the shop after 25 to 50 miles for a re-torque. Before you do anything, ensure to see that you have the right sort of bolts - Bolts and studs have various diameters, threads and settings, your wheel supplier should be able to advice on this. Also check to see that you the 4 plastic spigot rings which help the interface between the wheel and the hub. Next you need to jack your car up; do this in a secure way, and be sure to use axle stands, chock wheels still in contact with the ground and apply the parking brake. Offer a wheel up to the car and check that the bolt holes line up, that the wheel locates on the hub properly and that there is wheel arch, suspension strut and brake caliper clearance. If you have upgraded your brakes be SURE to seek advice and measure everything thoroughly before you order. The wheel bolts or nuts must be tightened to the manufacturer's precise torque. Be sure to re-torque after a 100 miles or so as they will compress slightly; tighten them increasingly till they're 3/4 tight then lower the car and complete the process. Also, always verify that you have the correct wheel fasteners for the job at hand. Whether using nuts or wheel bolts, make sure that the thread size is correct (shank diameter and thread pitch), and make absolutely sure that the fastener's seat style matches that of the wheels. Using an incorrect seat style will prevent secure clamping of the wheel to the hub and will result in loosening during operation. Never assume that the fasteners match the wheels. Again, packing/shipping mistakes are possible, so never blindly assume that what you have is correct. When fastener seat styles include 60-degree taper/conical seats, radius/spherical/ball seats or magstyle straight shank with washers. Never mismatch by using a mag/shank type fastener on a wheel intended for a conical seat, or any other mismatch. Only the correct matching type seat will provide the required wheel clamping. This cannot be over-emphasized. The use of incorrect seat styles not only can result in wheel damage, but also can lead to a tragic accident if the wheel either loosens or leaves the vehicle. Also make sure that the fastener does not bottom-out internally. This will prevent full clamping force, resulting in wheel wobble and almost certain failure of the threaded studs. It is important to keep your wheels clean at all times. Protect your investment. Some alloys have a transparent top coating designed to provide both protection and an ideal finishing gloss. This transparent protective coating must be maintained with the same care given to your car’s paint finish. We suggest cleaning the wheels frequently to keep dirt and break dust from altering the gloss finish. Remember, they’re often the dirtiest part of your vehicle because they are constantly exposed to the elements (corrosive brake dust, ocean salt, paint-chipping stones and sticky tar). Remember to hose all the loose abrasive grit off first. Clean with a soft un-abrasive cloth. Aluminum wheel polish can be used on polished wheels.